OR £29.32 per week 0% APR ? The Chesterfield Classic Suite available in 3+1+ Free Footstool Black Leather (Three Seater Settee and One Wing Chair and a Free Matching Footstool). The Chesterfield Leather Sofa with it's unique Low Back Style, Deep Buttoned Arms and Back complemented with a Single Buttoned Front Border. The Scroll Fronted arms on the Chesterfield Leather Sofa are attractively embellished with lines of individual stud nails. An undoubted winner in any room from the cottage to the boardroom. A classic of its kind ;Traditional Vintage British Style. For a FREE International Shipping Quote, please call us on 0044 1254 268896. For rough guide to the cost of Worldwide Shipping please click here. Our Chesterfield Sofas have previously featured on ITV’s 60 Minute Make Over programme. Click Here to view our Chesterfield Wing Chair on the Fox's Biscuit adverts. For a LIMITED PERIOD ONLY buy our Exclusive Classic Chesterfield Suites for Half Price. 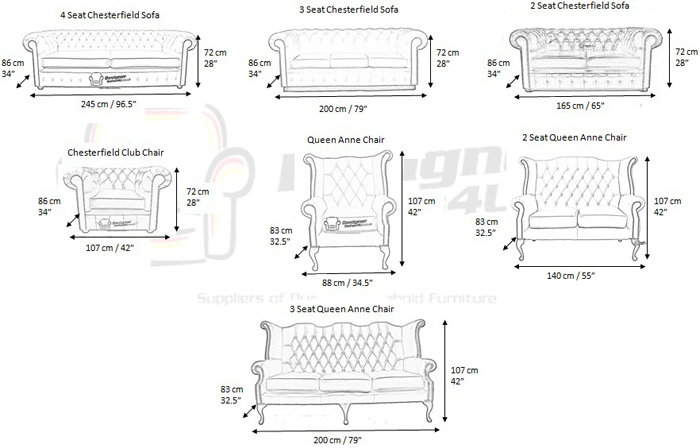 Massive Stock Clearence Event - Sofa Manufactured with 100% Top Grain Genuine Leather fully handcrafted in the UK. Delivery Lead Time 3-6 Weeks - normally orders are delivered to your door within 4 Weeks of ordering! Cleans, Feeds, Protects & re-instates the smell back into old and new leather items! Is a safe to use and gentle leather cleaner capable of removing even the toughest of stains from leather. Cleaning with a sponge to create a foaming action it will get into the grain and lift out dirt easily. Cleans - Safely cleans all leather back to a 'new' condition. Not only that but after applying the protection cream, all future dirt will be held on the barrier it creates and will wipe off easily. It helps stop leathers absorbing dirt! Conditions - Feeds the leather with natural oils and waxes preventing it from drying out and cracking. Repels Stains - Added barrier protection technology in the cream allows the leather to repel oil and water based stains, retaining them on the surface so the leather can easily be wiped clean. Protects - Not only from stains, the protection cream adds an invisible barrier to the leather that protects the leather from the elements. When you sit on leather you cause friction, continuous friction will wear away the leathers coating causing your leather to become rough and faded. The colour may even start to peel and wear off! The protection cream absorbs all friction and so helps prevent the above problems. NEW: Reduces Fading - With added UV inhibitors the protection cream now also helps prevent the sun from fading the leather when it is in direct contact.